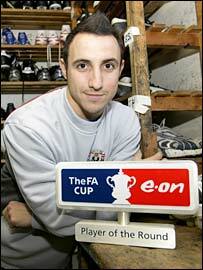 Coventry striker Michael Mifsud has been voted as the FA Cup "Player of the Round" for the third round. Mifsud scored twice in the Sky Blues' giant-killing 4-1 win at Blackburn. He will join the six winners from the previous rounds and four players from subsequent rounds in the "Team of the FA Cup" for 2007/08. The other contenders for the award were Gary McDonald (Oldham), Rocky Baptiste (Havant & Waterlooville), Aaron Ramsey (Cardiff) and Andy Robinson (Swansea). Fans can vote for their favourite player in each round on the FA's website. As well as a VIP ticket to the 2008 FA Cup Final at Wembley on Saturday, 17 May 2008, each of the 11 winners will receive a trophy and £500 worth of football equipment for a local school of his choice all courtesy of E.ON. The "Team of the FA Cup" so far comprises Jack Pitcher (Gloucester City), Matt Townley (Team Bath), Andy Forbes (Eastleigh), Craig Farrell (York City), Stuart Beavon (Weymouth), Craig Mackail-Smith (Peterborough) and Mifsud. Photos of the 2006/07 "Team of the FA Cup"